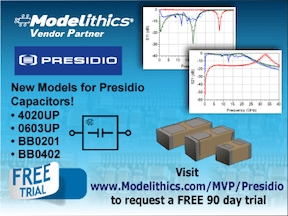 Modelithics has introduced four new models for Presidio Component capacitors. Both companies collaborated to develop high accuracy, scalable models for Presidio capacitors for the benefit of RF and microwave designers. Presidio is a Sponsoring a FREE 90-day trial of Modelithics’ component library. The new surface mount capacitor models added to the Modelithics COMPLETE Library and the new mmWave & 5G Library include those for the 0402 and 0603 Ultra Porcelain families (each validated to 40 GHz), and models for two broadband capacitors, a 10 nF BB0201 and a 0.1 uF BB0402 (each validated to 60 GHz). The BB0201 model, for example tracks particularly excellent insertion loss across the frequency band and all models are useful to accelerate microwave and mmWave design success. The Presidio MVP free trial library is available for multiple EDA simulation tools such as, Keysight Technologies’ ADS, NI AWR Design Environment/Microwave Office, Keysight Technologies’ Genesys, ANSYS HFSS and Sonnet Suites.